On one of my recent food truck forays, I tried a panna cotta from the Get Sauced truck in downtown Minneapolis. I had bought it and brought it back to my desk to eat while I worked. As I sat there eating bite after bite I was just blown away by the way that these simple flavors had combined to create such a complex eating experience. I think my co-workers might have got a little annoyed because after every bite I had to remind them how amazing this was. And I wasn't sharing. Of course I had another one a few days later and I knew that I wanted to try making it at home. 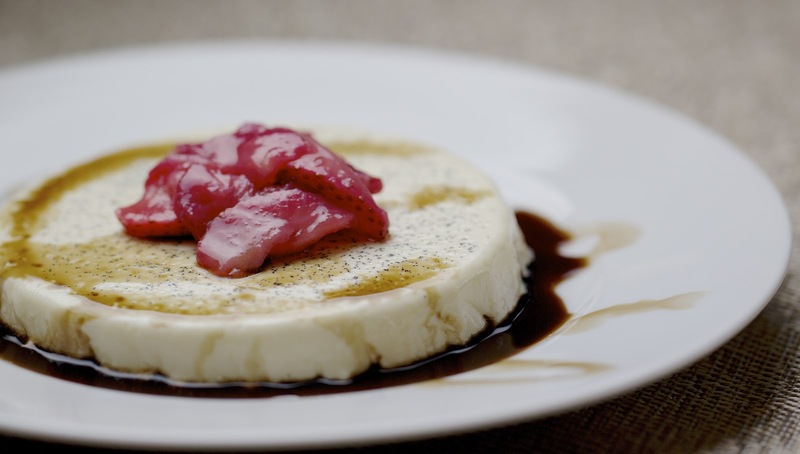 If you're not familiar with panna cotta, (and I had never actually made it before this experiment) it's kind of a mix between the custard in a creme brulee and a thick pudding. It uses gelatin as a thickener but otherwise the ingredients are almost identical to the creme brulee I typically make. There's no baking though, so after a bit of cooking on the stove top it is simply poured into custard dishes and chilled. When you're ready to serve the dish, it's inverted onto a serving dish. The best part of this is that all the beans from the vanilla pod have settled to the bottom and it creates a beautiful presentation. Or you could just eat it right out of the ramekin like we did on a few of them. It all tastes the same. 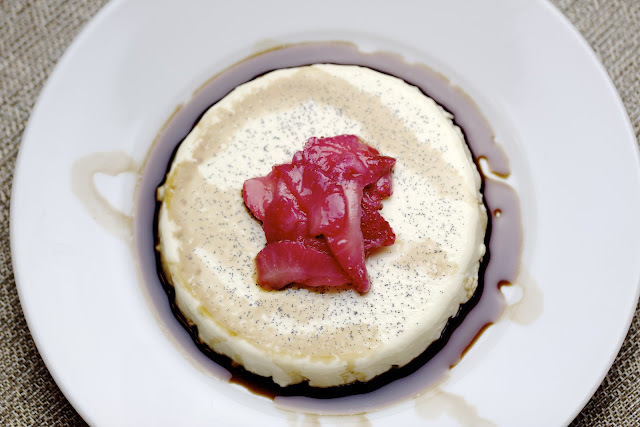 We were recently given a bottle of a beautiful 18 year aged balsamic vinegar and I absolutely loved it drizzled over the macerated strawberries. You could experiment with other fruits and sauces as well. 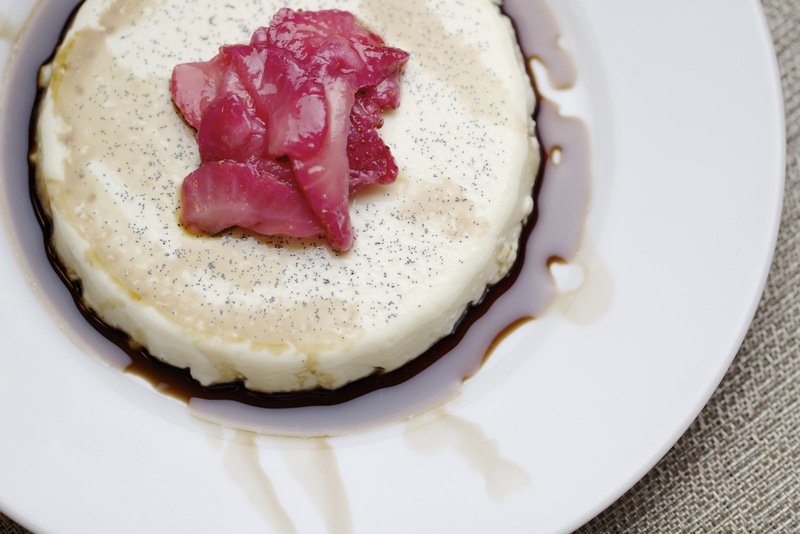 The vanilla flavor of the panna cotta goes so well with just about anything. The dish I was served from the truck was a bit softer than the dish I created so in the recipe below I also adjusted the gelatin to be a bit less for my next round. Combine the cream and sugar in a medium pot. Scrape the inside of the vanilla bean into the pan and then add the pod to the mixture as well. Cook over medium heat until the sugar is dissolved and the cream just begins to simmer. Remove from heat and allow the mixture to steep for 30 minutes. Sprinkle the gelatin over the cold water in a small bowl. Allow to sit for 10 minutes. Rewarm the cream mixture and whisk the gelatin in until completely dissolved. Strain the mixture into a separate bowl. Lightly spray eight ramekins with non stick spray. Divide the warm mixture between the ramekins. Chill for at least two hours and up to two days. To serve, use a sharp knife and cut along the outside edge of the custard and the ramekin. Place a small serving dish over the top of the ramekin and then flip it over, tapping the top of the dish to release if necessary. To make the macerated strawberries, slice them thinly and sprinkle with sugar. Let sit for at least 4 hours. This is so gorgeous! Love it! Beautiful panna cotta and balsamic with strawberries is always delicious! We have this EXACT item on our dessert menu right now! I serve it in a glass, vanilla panna cotta, fresh berries, drizzled with balsamic glaze and topped with whipped cream! Ppl love it! 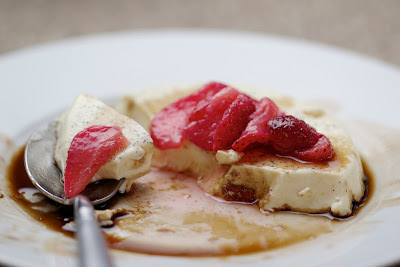 I adore strawberries and balsamic together! This looks wonderful.